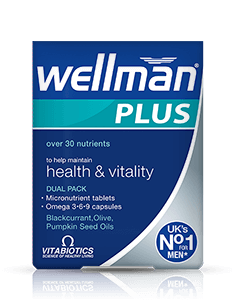 Wellman 50+ is a comprehensive nutritional formula with over 30 nutrients developed to safeguard the special nutritional needs of men aged 50 and above, from Wellman, the UK’s number 1 men’s supplement brand. The tablets are ideal for men over 50 with an active lifestyle, unlike a general multivitamin, they contain specialist bio-active nutrients to help maintain health & vitality with specific support for male health, including iron, which contributes to the reduction of tiredness and fatigue. Getting older shouldn’t mean you should have to change your lifestyle and the activities you have always enjoyed. 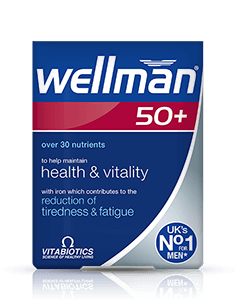 Wellman 50+ contains vitamins B6 and B12, copper and iron which contribute to normal energy release. Exercise is important to continue as you age, studies have shown that exercise provides many health benefits and that older adults can gain a lot by staying physically active. Zinc, selenium and vitamins A, B6, B12, C and D have also been included in the formula as they contribute to the normal function of the immune system which is very important as you age. The eyes are one of the most complex organs and as you begin to age it’s even more important than ever to look after them. The retina and the lens can be damaged over the years by exposure to sunlight, smoke and pollution. 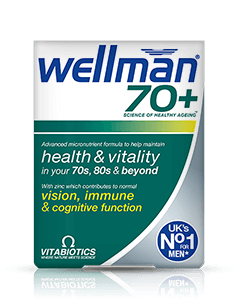 Wellman 50+ provides vitamin C and E which contribute to the protection of cells from oxidative stress, plus mineral zinc, which contributes to the maintenance of normal vision. Wellman 50+ contains vitamin B1 which contributes to the normal function of the heart. It also contains a combination of folic acid and vitamins B6 and B12 which contribute to normal homocysteine metabolism, and normal red blood cell formation. The formula also includes vitamin C which increases iron absorption, which is important especially with vegetarian diets as iron contributes to the normal formation of red blood cells and haemoglobin and normal oxygen transport in the body. Wellman 50+ contains vitamin B6 which contributes to the regulation of hormonal activity. The comprehensive formula also includes zinc which contributes to the maintenance of normal testosterone levels in the blood and normal metabolism of fatty acids.